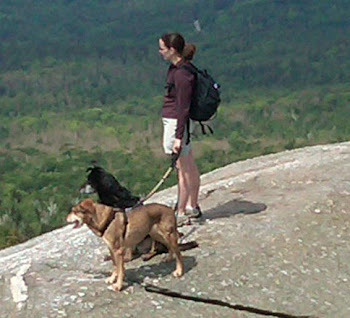 Foster dogs hiking in search of adoptive homes. See and share their adventurous journeys to the summits of the highest peaks in New Hampshire. What if Michael Vick was a DVM? It is a scary thought, but the reality is apparent here in the Live Free or Die State of New Hampshire. This is a warning for pet lovers about a corrupt scheme that has been discovered at the non-profit All Better Pets - a 501(c)(3) organization that is operating out of the AVC low cost emergency veterinary clinics in Manchester and Concord, New Hampshire. We are posting this SCAM ALERT to keep you and your pets safe from harm. Trust me when I tell you that your pet would be better off dead than placed for adoption with All Better Pets. Don't support this scam in any way. If you are a rescue or a pet owner, stay as far away as possible from the place. If you have donated money here, ask the Charitable Trusts Division of the Attorney General's Office to investigate what happened to your money. The board members of this non-profit are the clinic owner, her husband and three employees. That information alone should raise eyebrows, but the finances behind it all are even more frightening. Why do you feel this is a scam? Are the original owners complaining to you? Are the pets actually adopted out to new families or euthanized? Why is this a scam? Have original owners complained? Were the pets healed amd adopted out to new families or euthanized? How are things along Route 93? Tell Joanne I send my regards. I think she should become a CASA. Oh and another thing Shari, is your hubby still working as an air traffic controller. I am a budding ufologist who would love to interview someone who is a real flyer so to speak. Let me know. I think All Better Pets is wonderful. I have no complaints! Well, it will be interesting to see if the IRS thinks it is so wonderful. Also, I personally have a problem with a veterinarian who steals pets from people and kills them for pure profit. Her real name should be Dr. Killaway because that is all she is interested in doing. This is a sick and twisted corrupt scheme from hell! I have all the evidence of it! How can I help get this changed? I was going to help thru save a lab but was unable do to NH regulations. Did you fall for this scam? My own canine companions who have hiked many miles with me are now ages 13 and 14. They were adopted from local animal shelters. While my dogs still enjoy the shorter hikes, they prefer to spend their leisure time engaged in lower impact activities such as swimming and sunbathing. I wanted to continue hiking with dogs, and I believe in the foster care model of providing temporary shelter for homeless dogs. Now, I am hiking with dogs who are in foster homes. Welcome to Foster Dog Summit where you can see and share their adventurous journeys to the summits of New Hampshire's highest peaks and help find them a home! Foster dogs hiking in search of adoptive homes. See and share their journeys to the summits of New Hampshire's highest peaks. Copyright 2011 Foster Dog Summit. Picture Window theme. Powered by Blogger.